Was just purging my old laptop of its stuff when I found this.... First part of a few which will be completed in time, weekly, monthly, quarterly. I can't say for sure. The posts will go in a chronological manner as far as possible. The Austral Wheel Race is Australia’s longest surviving professional bicycle race, and the oldest continuing handicap race in the world. The start date of the Austral wheel race remains disputed, but the current official version states it at 1887 while the Argus during the turn of the 20th century had it listed as beginning in 1886. In a very short space of time, the Austral wheel race captured the imagination of the Australian populace and fell out of favour just as swiftly. The race in its zenith was raced on grass before plummeting to its nadir on wooden bicycle tracks (velodromes, if one might say). The Austral was a 2 mile handicap race (now 2km). Weaker riders were, and are, given headstarts. The strongest riders started on scratch, ie, furthest back and in exceptional cases, even a negative handicap (even further back). Australasian newspaper. It was then the highest prized bicycle race in the world. As a comparison, Ranjitsinhji (better known as Ranji) received £400 annual allowance during his education in Cambridge. Nothing too special, apart from the fact that Ranji was a nephew of the Jamsaheb of Nawnagar. Albeit, he did end up bereft of cash quite often. The money came primarily from two sources. Firstly, the Melbourne Bicycle Club, and secondly, the punters attending the event. The MBC was riding on the wave of the bicycle boom of the late 19th century. The latter further explained below. already hosted the first test match between an England XI and Australia (Vic and NSW XI then) a decade ago. By the 1890s the race used to attract massive crowds of around 30,000 people. The race had already captured the interest of hordes of Australians. While each edition was significant in the early years, one edition of the race stood out in terms of its importance in years to come. 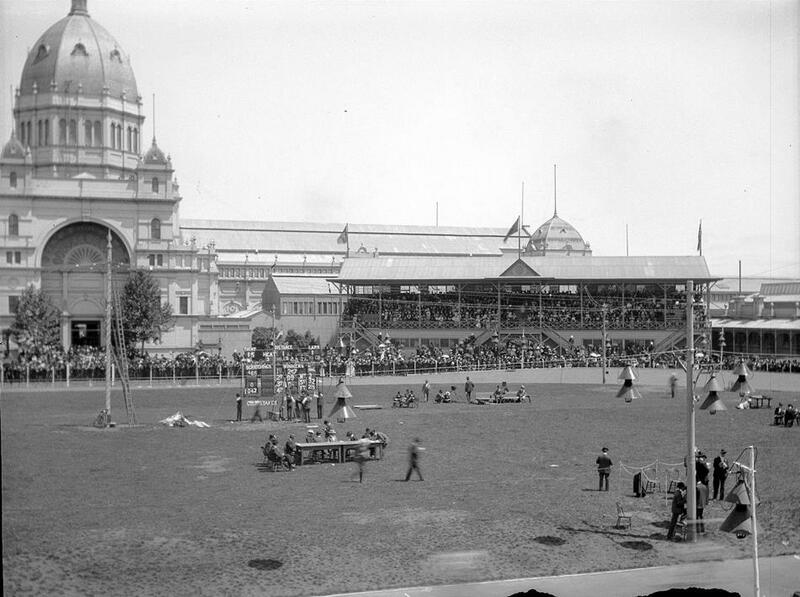 The 1898 Austral was again raced in the MCG and had an attendance of around 30,000 people, more than most tests of the time. In attendance of the event were, among others, the Governor of Victoria, Sir James Fairfax and a clutch of ministers. 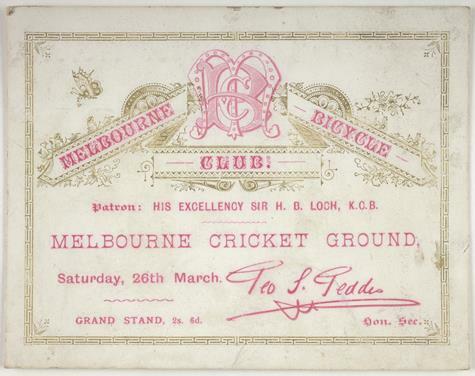 The gate receipts from the event amounted to a stunning £1200, the second highest recorded at the MCG at the time (It’s a guess, but I wouldn’t be surprised if the record were achieved in the Ashes decider when AE Stoddart’s England side toured Australia. England won the Ashes that year). The net profit, amounted to a handy £1500. Overall, a very successful event. It was a popular description, almost cliché, that said that handicap racing was the combination of front men (frontmarkers) beating those on the rear mark. As with horse racing and some motor racing formats, the strongest riders were given the most difficult handicaps while the weaker riders had a more favourable handicap, in this case, a head-start of stated number of yards. According to the Argus, none of that happened and every man rode for himself at break neck speeds to such an extent that they were nearly matching the world records for grass tracks. The heats were won mainly by second raters with favourable handicaps, much to the chagrin of the favourites who complained of harsh handicaps for them. The main contenders for the race were Finnigan, Jackson, Garguravich, Morgan and Clinton. Finnigan started at a generous 220 yards. Clinton at 100 yards. At scratch (0 handicap, ie, headstart), were Taylor, Morgan and Tame. The latter trio raced hard in the early stages in the hopes of catching upwith Fontaine and Clinton. Taylor doing the grunt work. While they were going so, Garguravich was flying 20 yards back. Garguravich and Bennett attacked broke away from the group in an attempt to catch the leaders. Jackson was in fine form, but the generous handicap was too much to make up. MacGibbon, Mathews, Stapleton and Finnigan were together in the 3rd lap of 8. Surprisingly, whistles were heard from the crowd. After a short while, it was observed that a couple of riders were making pace on the basis of whistles. Later, it was observed that the whistles were targeted towards Finnigan to help him too. At the mile mark, 4 laps completed, Bennet faded, Jackson caught the second group and the three Middleton brothers' strength displayed. On the next lap, lap 5, Finnigan was in the lead with Mathews and Bennett with him. Morgan and Stapleton were there too but struggling. heard the roars from the crowd and seized control. At the bell, the order was Finnigan, Mathews, Morgan, Middleton and Garguravich. MacGibbon, Brooke and Stapleton also in contention. On the last corner, Mathews fough to wres control from Finnigan. Middleton challenged both from the inside and Morgan on the outside for the home sprint. Finnigan shook all off and won the rich Austral wheel race. One interesting aspect of reporting from the era was the use of terms now associated with horses: trainers, stable mates etc. The most famous and consequential edition of the Austral ended with Tom Finnigan pocketing a massive 240 gold sovereigns. Like his contemporaries, Finnigan took up the preferred occupation of retired sportsmen of setting up a sports business, in this case, a bike shop. The address according to the Historical Society of Malvern and newspapers of the time list it as 185, Glenferrie Road, Malvern. This has been wrongly reported as 58 Glenferrie road by other sources. This store, in 1903, was to sell Australia's first Malvern Star bicycle. The business really started taking off after Finnigan was convinced to place a modest advertisement in the newspapers. Finnigan later sold the business to Bruce Small. Small employed a young Hubert Opperman whose subsequent success and star grew the company more rapidly than ever becoming one of Australia's leading bike manufacturers. The Melbourne Cricket Club earned pots with the Austral, but the club itself never warmed to the professionalism, but more importantly the betting. As noted in Ride magazine, the bicycle boom started dying down at the turn of the 20th century. Also, the racing itself was largely dull with frontmarkers having healthy enough handicaps to make it near impossible for the scratch riders. With big betting, came big problems. In 1906, there was a betting scandal, read race fixing, which led to the resignation of a trustee of the Melbourne Bicycle Club and also the President of the MBC. As alleged by the Argus in 1956, John Wren won £7,000 on the victory of 41 year old American Bill Martin from scratch, with the very enticing odds of 12/1. In 1903, a race judge was asked to resign after it was discovered that he'd bet on the race. To lure patrons, the organisers resorted to novelties. Pigeon flights appeared in 1907. A year later, the Leader maintained that ballooning and parachuting had "more to do with drawing the big crowd than the afternoon's racing, which was very tame." In mixtures of spectacle and foolish insanity, balloonists clung to trapezes, performed parachute jumps and even tried to glide to earth while mounted on a cycle. It was hoped that the 1910 Austral would provide cycling with a fresh start. Advertisements promised a "Revival of the Pastime", as the sport was now "Clean" and "Straight", with "All the Old Element Passed Out." On top of that, just 10 months after Australia's first powered flight, the Melbourne Bicycle Club planned to delight spectators with the rare spectacle of an aeroplane taking to the air. 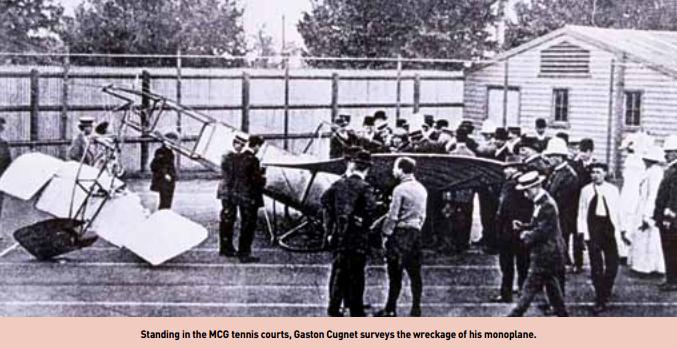 In 1910, the combination of aeronautics and cycling was not as incongruous as it appears now. In the Australasian, for example, these fields (and motoring) were jointly covered under the heading "Wheel Notes", while the French, in particular, regarded aviation contests as sporting events. did take-off. After a couple of rounds around the ground, Cuniet tried to pass through the gap between the MCG scoreboard and the Member's Stand (the MCG of old was more akin to what we see in the Member's and Women's stand at the SCG than the big concrete engineering marvel lacking in character that the new MCG is). The gap, described as two and a half times the width of the plane, was a risky manoeuvre at the best of times, let alone with a wind. Inevitably, the plane's bottom struck the spiked fencing before crashing. This signalled the end of the Austral's affair with the MCG. The crowd for the final in the following week was nowhere near the dizzy heights that it reached prior to the turn of the century. All this resulted in the shifting of the Austral from the MCG to the Melbourne Exhibition Oval. Bicycling, which for a decade had looked like Australia's pass-time had exceeded its use by date. As the Argus, in 1956, described, the Austral had, at its zenith, gained a stature of a classic, The Melbourne Cup of wheelmen. Indeed, it made an indelible mark on the MCG too, with the wheelmen of the Austral making their way into the MCG tapestry alongside the greats of cricket and football (VFL/AFL code). Addendum: Don't get surprised by the attitude towards professional sport. Cricket was an amateur sport with around half of its players being professionals, greater professionalism in Australia. The biggest stars, Grace, Ranji, Jackson, Murdoch etc. usually amateur. In England, especially, amateurs were held in higher esteem. Being paid to play a sport/game was never thought highly of. Amateurs used to be captains and the first professional English captain was Len Hutton in the '50s. They also received benefits from the club where they played as opposed to the often poverty stricken professionals. WG Grace, in his inimitable style, in the late 19th century publicly chided professionalism. It took till the Second World War to reduce greatly the nature of perception of the amateur and professional game and another decade or so to destroy it. But it did lead to lesser cheating, generally, and also created the culture of testimonials and benefit years. Could do with a justify alignment for ease of reading. Afternoon, I guess this second part will be as difficult to read as it was to write about quite simply because of the boredom from the previous comparisons to Ashes tests, the Melbourne cup and what was, and remains to this day, the fabric of Australian sport to just writing about a bicycle race. While the lustre of the race had clearly dulled down in this period, the Austral still remained the richest bicycle race in Australia and still offered substantial sums in comparison to their professional contemporaries. So to speak, it was the Jacques Villeneuve of bike races with the giddy peaks at its infancy to the long drawn out ensuing mediocrity. The farce of 1910 saw a change in the management of the Austral with JW Williams taking over from the MBC. Williams’ intention was to run the Austral alongside his Melbourne six days races, an endeavour in which he was successful in 1912 as the 1911 Austral does not figure in the official records. One interesting advertisement was seen was in the 1st April, 1911 edition of the Morning Standard. In 1910, CA Piercey won the Melbourne Warnambool (interestingly, also a handicap race back then. Just a different format with riders getting a time handicap as opposed to distance) road race on a BSA Hercules bicycle with a 47 minute handicap in 10h1'21”. Nondescript, but for the fact that the BSA Hercules brand is stll available for purchase in India, albeit under a different company. In 1912, the Austral had restarted and was raced in the Exhibition Oval. Priestley took the win by a matter of inches from a low handicap of 60 yards. The race was not free of controversy with a rider by the name John William Wilson suing the organiser, Williwams, for a sum of £100 for not allowing participation in the race. The venue hosted another edition the following year. While the First World War provides a comfortable, and accurate, explanation for the absence of Austral races between 1914 and 1919, it is to be noted that according to the Referee journal in January 1914, no mention had been made by the promoters with regards to the 1914 Austral. The 1914 edition of the Austral wheel race was already in doubt and as it turned out, war broke out a few months. This signalled the suspension of the race till 1920. The Austral returned in 1920, and again not as a standalone but as part of bigger “wheel and foot racing” carnival. The carnival, organised by Summer Nights' Amusement Company, held a series of cycling events in March including an interstate competition (in which NSW edged out the Mexicans Queenslanders). Ernie Tamme won the 1920 edition of the Austral. There were two editions of the Austral in 1925, this one will focus on the latter of the two. 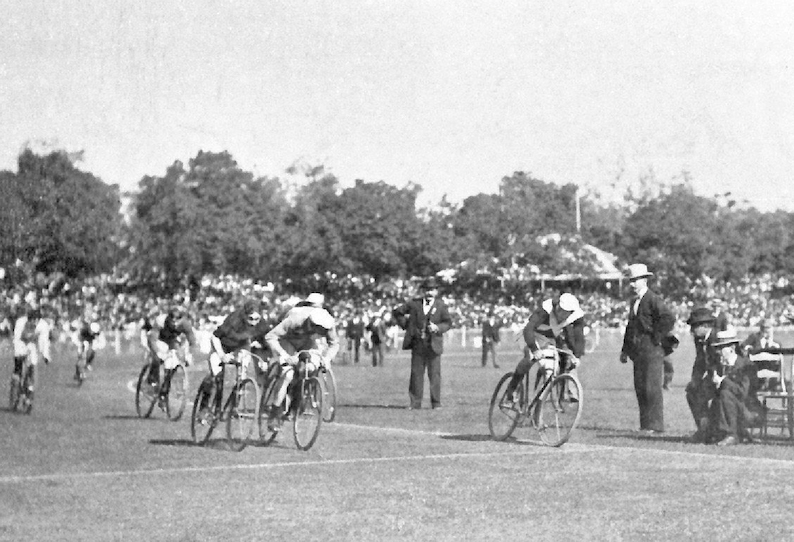 As with the 1898 Austral Wheel Race, the 1925 Austral gained importance due to one individual again connected to the Malvern Star bicycle business. This time, it was the 1924 Australian national road race champion and later widely renowned cyclist and politician Hubert Opperman (he was the Immigration minister when the white Australia policy was ditched). Opperman had set many motor paced records in the era and had mastered the endurance scene over later years in Australia and even in Europe. One interesting feature of the 1925 Austral was that the race was a one mile exhibition race. Other races included the 5 mile scratch race too. 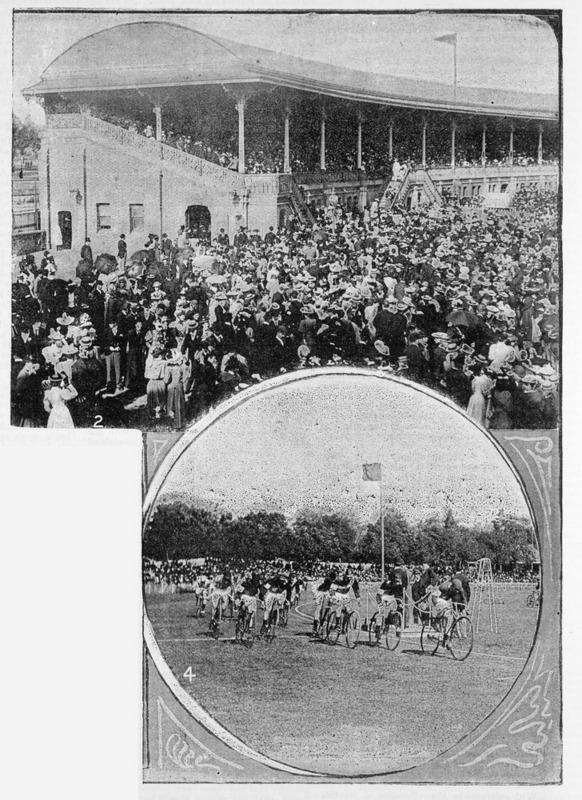 The absence of any international riders had left the attendance for this edition of the Austral at only 6000 (as compared to 20,000 in 1920) and was again held at the Exhibition Oval. 1st heat: Clinton won the first heat by a very comfortable four and a half lengths over McLeod and Dempsey in a time of 2'7.4”. 2nd heat: In the second heat, Block from a handicap of 70 yards edged out Beveridge by half a wheel. 3rd heat: Gibaud, a former amateur Australian track champion, with a handicap of 60 yards won the heat by half a length over Box and Sutton. 5th heat: H. Opperman, former road champion, was given a generous 120 yard handicap. Unsurprisingly, he tore the field with a 12 length victory and completed the course in 2 minutes 9 seconds. 8th heat: James Hannam alias Jim Nagel (more on that later) beat Hehir and TJ Robinson by 2 lengths in the slowest time among the heats of 2'14.4”. It has to be noted that there were falls in the first, third and eighth heats. of Opperman, Gibaud and Nagel. In a reportedly intriguing finish for the trio, they were going wheel to wheel into the last furlong of racing. Gibaud came out on top by just half a wheel ahead of Opperman with Nagel just a further few inches behind Opperman. Ken Block finished fourth. James George Charles Hannam (1895-1979), waterside worker, trade unionist and cyclist, was born on 26 October 1895 at Balmain, Sydney, third child of native-born parents James Hannam, butcher, and his wife Elizabeth Maria, née Hartland. A blacksmith by trade, young Jim enlisted in the Australian Imperial Force on 29 August 1914; he was then 5 ft 7 ins (170 cm) tall, with grey eyes, fair hair and an athletic build. Posted as a driver to the 1st Divisional Ammunition Column, he embarked for the Middle East in October 1914. In Egypt, in September next year, he was sentenced to fifty-six days field punishment for leaving his picquet without orders. He was sent to France in April 1916 and was briefly attached to the 101st Battery, Australian Field Artillery, before returning to the 1st D.A.C. in October. In 1916-19 he was court-martialled on three occasions for absence without leave and related offences; he was sentenced twice to field punishment and once to a year's hard labour, most of which was suspended. He was discharged from the A.I.F. on 23 December 1919 in Sydney. Hannam returned to France as a professional cyclist and came back to Australia in 1924 on contract as 'Jacques Nagel, the Flying Frenchman'. In the parsonage of the Congregational Church, Richmond, Melbourne, on 2 September 1925 he married 19-year-old Doris Ada Louisa Riley. She was the daughter of Tom Riley, secretary and a founder of the Port Phillip Stevedores' Club, one of two branches of the Waterside Workers' Federation on the Melbourne waterfront. Jim joined his father-in-law on the docks and picked up casual work as a wharf labourer: 'We had our own foremen that we used to follow and we knew how many men they were going to take. It was open pick-up. We'd all stand around in the yard and the boss would come on the platform and he'd call your names out, or just point to you'. Continuing his sporting career under the assumed name of 'Jim Nagel', Hannam regularly competed in cycling events in Victoria. On 1 February 1926, described as the 'champion of France', he was beaten at Geelong by H. K. Smith, holder of the Australian road championship. 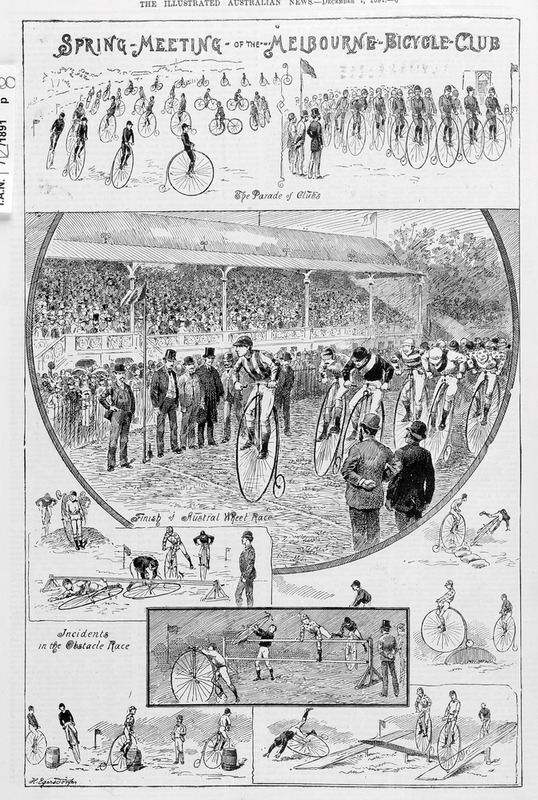 At the Exhibition oval, Carlton, on the 27th 'the French-Australian J. Nagel' won the ¾ mile (1.2 km) handicap and the five-mile (8 km) scratch for professionals. In 1928 Hannam was caught up in waterfront industrial troubles which flared with particular violence after the Bruce-Page government's legislation encouraged non-union labour to work on the wharves. On 2 November at Princes Pier, Port Melbourne, police fired into a crowd of W.W.F. strikers who were bent on driving off 'volunteer' strike-breakers. One waterside worker subsequently died from gunshot wounds, and three, including Hannam, were wounded. Having recovered from the bullet-wound to his arm, Hannam attended the wharf-labourers' pickups for casual work throughout the Depression. When, as often as not, work was not available, he filled in otherwise idle hours training for cycle races. Remaining on the waterfront, he finally transferred at the age of 69 to the reserve 'B' Register in 1964. He died on 9 April 1979 in South Melbourne and was cremated; his daughter survived him. One certain method to dilute the image of a sporting event is to play it so often that it leads to overkill. With a lack of ownership of the event, and no strong central council to regulate it, the Austral fell down this route as three editions by three different organisers were scheduled in 1927. Two of them towards the end of summer and beginning of Autumn and one in the next summer in November/December 1927. The first of the three Australs in 1927 was organised by the Aspendale's Carnivals, Ltd. at the Exhibition track on the 23rd and 26th of March. The 1St heat was won by Brady ahead of Middleton as the pair qualified for the final of this Austral. The 2nd was won Purcell took the win from Rowe (both highest handicap) after the pair paced each other well and despite Rowe falling, he mounted back on the bicycle to claim second. Kennedy and Clifton finished third and fourth respectively. The 3rd heat was won E. Evans ahead of Hawkins, Clulow and in fourth was Bowie Stevens. In the final, Kennedy led at the bell but Stevens took control entering the back straight. Middleton pushed him close in the home straight and final sprint but Stevens edged out Middleton by half a length. L.C. “Bowie” Stevens had a handicap of 70 yards while A.A Middleton was 140 yds and H. Brady of South Australia finished third had 85 yds. A.A Middleton was indeed part of the famous Middleton family mentioned in the previous post. Middleton's father, Alf Middleton had won the Austral 33 years prior to the 1927 edition. The second of the 1927 Australs took place in the month of April in the Melbourne motordrome. It didn't receive the fanfare that the first 1927 Austral received but has been recorded in the honour roll with Cecil Hannerman over Browne and Shale. The third of this overkill party was held over a couple of weeks at the end of November and start of December. Four heats were held in the last Saturday of November and the three remaining heats and the final were held in the first Saturday of December. Opperman again appeared in the race as he competed in the fourth heat, but was unplaced and missed out on the final. The final was contested between 28 riders and J. Parmley, a scratch rider, conceded a handicap of upto 350 yards. Cecil Manners (245 yards) edged out D. Ryan (285 yards) in the finale. 245 yards was then, and remains, the third highest handicapped rider to win the Austral suggesting that it might have been a bit liberal. The coverage of this edition of the Austral, by my reckoning, was as weak as it had been. Concurrently, L.G. Lukey from Christchurch attempted the unpaced Australasian amateur record for distance cycled in an hour (Australasian amateur hour record in simpler terms). 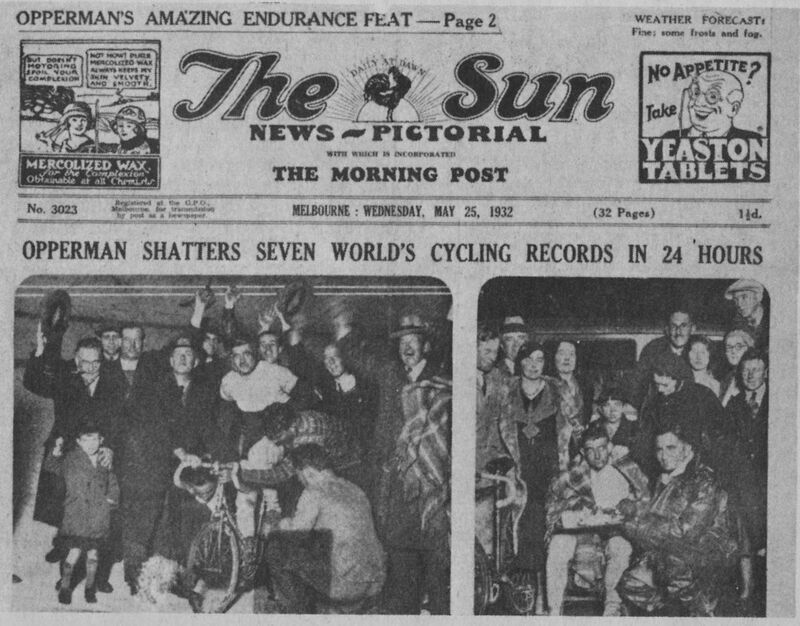 The record was held by J Davies from Carlton who had ridden 24 miles 1,418 yards in an hour at the Melbourne Motordrome itself the previous year. Lukey attempted the record on a 16 gear bicycle. In his first attempt, a puncture scuppered Lukey's chances. He took a second bite at 6pm in the evening, but by this time, there was a breeze in the motordrome to hamper his attempt. Despite the difficulties he completed 24 miles 110 yards but failed to trouble Davies' record. Surprisingly, the actual purpose of Lukey's visit was not the hour record attempt, but to represent New Zealand in the Colac to Melbourne road race in which he competed from scratch (another handicap race). No Australs were held in 1928 and in 1929 R.W. “Fatty” Lamb won the race and pocketed £250 pounds on his victory. 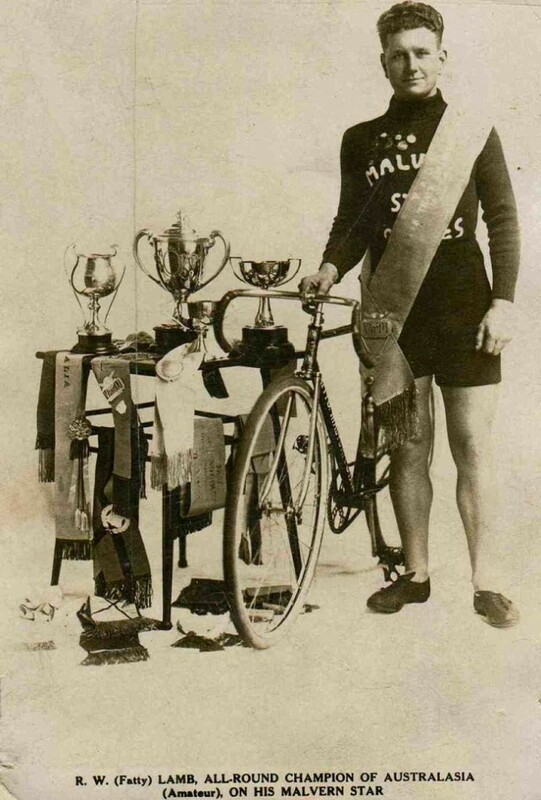 Despite the rather ignominous moniker, Lamb was a fine cyclist and his omission from the 1928 Olympic Australian cycling squad caused the honorary secretary of Australian Amateur cyclists to outrage that it was an inexplicable decision for a brilliant and consistent rider. One thing that the Austral failed to when in a position of strength in its history is to lock in a position in the calendar as the time of the Austral. Where Boxing Day has traditionally been a cricket day with first the Victoria NSW matches and later Boxing Day Tests, the last Saturday of September or first Saturday of October has been locked in as the Grand Final week, the Melbourne Cup in the first Tuesday of November, the Austral fluctuated between March to April to November and December thus failing to create a date synonymous with the event itself. Addendum: Amateur sport isn't a money business. Honorary positions were the norm. These days they create images of incompetence and politics. But while the norm then, they created the same images of incompetence and politics. Demands of involving more sportsmen in governance of sport is almost as old as organised sport itself. While not a very good comparison considering how much more power the MCC members (Marylebone cricket club) had in society in general compared to the motley Australian counterparts, the MCC members were influential conservatives and Lords of the era. As an example, Stanley Jackson, who started off as a Cambridge cricketer, captained England, joined the Conservative party, went on to become Governor of Bengal where he survived an assassination attempt by a freedom fighter student and after all that went on to join the MCC again. Their Australian counterparts (Australian Board of Control) were usually cricket club presidents with nowhere near as much influence as their MCC counterparts and depended upon the negotiation of the then South Australian Governor, and later Governor General of Australia, Lord Alexander Hore Ruthven to keep the bodyline series alive and possibly even larger long term implications. The ABC members would've exercised influence comparable to the Amateur Cyclists Association members.